Sarah E. Lee was born in 1838 in that part of Lowndes County, GA which was cut into Berrien County in 1856. She was a daughter of Moses C. Lee (1808-1884) and Jincy Register, and grew to womanhood on her father’s farm east of Ray City, GA. In 1883 she married William C. “Babe” Patten in Berrien County, GA. The couple made their home and farm in the 1300 Georgia Militia District, at Watson Grade. 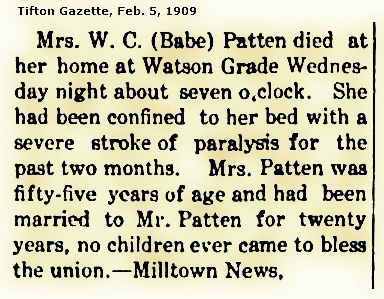 Mrs. W. C. (Babe) Patten died at her home at Watson Grade Wednesday night about seven o’clock. She had been confined to her bed with a severe stroke of paralysis for the past two months. Mrs. Patten was fifty-five years of age and had been married to Mr. Patten for twenty years, no children ever came to bless the union. – Milltown News. Sarah Lee Patten died on Wednesday, January 27, 1909. She was buried at Union Church Cemetery near Milltown, GA (now Lakeland). W.C. “Babe” Patten, after the death of his first wife, married Sam Watson’s sister, Laura Watson.